How could one prevent drunk users from using a mobile application? Consider a mobile application which for some reason needs to prevent drunk users from using it (e.g. to avoid dreaded "drunk dials" or "drunk texts"). How could "sober authentication" be executed from a human interaction point of view? There must be a balance between usability of such applications for sober users while providing some mechanism to protect against the "drunk dialing" problem. Please additionally consider that there also could be elderly or disabled people who may act slower and less precisely similar to how a drunk acts. An accessible app would need to accommodate them as well. I think you should test users "motor coordination" & reflexes. After all, that's what traffic police does when he stops you. Some sort of game where the user needs to quickly burst some randomly appearing bubbles (= reflex test) and draw straight lines (= motor coordination test) on the screen comes to my mind. Alcohol impairment is also characterized by poor perception of time...have them hit a button in 10 seconds with no timer or something. Other than a silly novelty thing (e.g., the gmail labs "mail goggles") or requiring a breathalyzer attachment to activate (e.g., your application starts automobiles for people with past DUIs), its not worth it. Assuming your application is useful and people will want to use it while both drunk and sober, any barriers that could differentiate the ability of some moderately drunk person and a sober person will filter out a lot of sober people. Requiring fine motor tests or math/memory questions will let lots of drunkards through and frustrate a lot of sober users, especially if the user is in a rush, commuting, or multitasking. For example, I primarily use mobile devices mostly while commuting on the subway. I won't be able to trace a line easily as I'm standing on a moving train with people bumping into me; or it may take extra time to type in math answers with one hand holding the device and the other switching back between holding a pole and typing on the device. Most of the time when one is moderately drunk (BAC ~ 0.10), you can temporarily focus to pass these sorts of tests if they try. A college friend would always try doing difficult math while drunk (e.g., advanced calculus and do it correctly) and then shortly after pass out or vomit. How do we know when to test if the user drunk? How do we know you're drunk? Speech recognition is an advanced possiblity. Computer analysis is now possible which can detect slurred speech. This will likely work for a majority of users, but it's important to consider users may be mute or may be using their phone where speaking aloud would be inappropriate; while a nice feature it should not be the only way to test drunken users. The easy software solution would be an integrated breathalyzer; this of course requires specialized hardware, but isn't completely infeasable; these devices are cheap and could be a peripheral or built into a handset from the get go. Barring speech recognition and specialized hardware, a motor skill and or reaction time test is the common solution; alcohol significantly impairs task performance. Allow a user to set a baseline performance (to accommodate users with better or worse motor control/reaction times than typical) and give them a test. Common motor skill tests could be simple commands like "tap here" on a touch enabled device or a typing test. Asking a user to set a "drunk baseline" would be a very bad idea; never encourage irresponsible behavior. What do we do if they're drunk? Give the user several tries to retry. I would hesitate to ever implement a "lockout" that prevents future tries. You could leave a lockout or timeout feature as a configurable option; users with poor motor skills will want it off, but, ahem, "power users" of alcohol might want the extra security a lockout provides. The breathalazyer attachment DOES exist. You could maybe get some ideas from the Social Media Sobriety Test - this includes drawing a line along the screen and keeping it within the prescribed box - haven't tried it after drinking so can't tell you if it works! It depends a bit on how the user interacts with your application, but I would collect different metrics about the user input during normal use. If it is a texting application you can collect metrics about how far from the middle of the letter-buttons the user presses. The speed the user is typing, the variance of speed etc. I would combine several metrics and if the metrics deviate more than normal you can assume the user is drunk. You need to engage yourself in some testing what metrics that are affected by beeing drunk (hey, how can I help :-) ). In a game or similar you could keep track of the user precision. If the user performs much worse than normal you can assume he is drunk. Another alternative would be to exploit the fact that drunkness affects reaction time. Create a lock screen with dots appearing at different locations. Measure the reaction time until the user points at the dot. You can also measure how close the user points. Three good picks in a row and you have a non drunk user! You could use facial recognition to check for Postitonal Alcohol Nystagmus, which is a common field sobriety test. You'd have to be careful with implementing this because nystagmus (the "jerking" eye movement) is common enough in the general population and has other non-alcohol related causes. If you were going to try to control for alcohol related nystagmus, I think there would have to be a way to recognize the position of the head. Because according to the linked Wikipedia, the head has to be aligned with the spine (head can't tilted), so doing that might be a little tricky. Try to get them to solve some simple math problems within a time limit, like 11 x 11 = ? within 5 seconds. I am sober and I solve the problems and send the mail anyway.. Your problem states that you may have elderly and disabled people. You may test , for example coordination and reflexes when the user "swears" he is sober and thus creating a baseline. If your score deviates by a To-Be-Decided(TM) value you may be locked out. There is no definitive test you can use, but your best bet is to monitor usage over time, and when some precision is being lost, then lock the app, on the assumption that user is either drunk, or at least not completely with it. The problems are legion. For example, when I have a cold or am ill in other ways, I am less capable of achieving these sorts of tasks. It might be a good idea to keep me off it, depending on what it does. These sorts of test are only demonstrating certain reaction times - if that is what you need, then you can use this. There is also the definition of "drunk". When I am very drunk, I can still achieve a remarkeable amount. When I am slightly drunk, I am sometimes better than normal. Do you want to stop me after one glass of wine? Or two? Or two bottles? How drunk is an issue? I think you would do better to define something more definitive than "drunk", because it is not a clear term, and it is not easy to detect - and differs between people. Assuming you could come up with a method that 100% of the time would identify a drunk person as drunk and a sober person as sober how would you enforce I (a drunk person) don't get Andy (a sober person) to do the test for me? Does this matter? 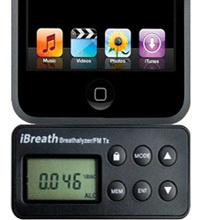 For high accuracy: It would not be good for distribution but you could sell a hardware alcohol detector that doubles a case for the mobile device. For low accuracy: Assume users are drunk Fridays and Saturdays after 7:00 pm and all other days after 3:00 am. Alternately you could ask users when you expect them to be sober when they will be drinking. Another variation of a time lock would be make the application activation only available after x seconds/minutes for y seconds. So you select the application and it would say "Activate period in 40 seconds for 5 seconds"
It might be harder for a drunk person to A: wait and B:get the timing right. Here is a different approach... Use Geo-location and match it to google maps data on bars. If a phone has spent prolonged time in one location in close proximity to a bar, it would ask you if you might be too tipsy to send this message. Finally, a product that solves the whole issue. Build an app around it that doesn't let you text until you blow into the nozzle. [humor]Move a button around when the user clicks on it. That way he is either bound to get irritated back to sobriety or throw the phone away. On a serious note I think the most important parameter is the users co ordination. The best way I feel is to create a quick game screen which moves things around and challenges the user to stop them from moving by catching them which requires solid co ordination. [humor again. maybe serious?] Or make him play Drunk Man video game (Android) and compare the scores. It's not possible to prevent a drunk user from using the app. However, you can try to positively influence the behaviour of your user. What are the resulting actions that could ensue, should a drunk user actually use the app? Are there usage patterns that are recognisable as a sign the user is using the application while intoxicated? How best can you remind the user that they need to exercise caution if these signs are detected? It's also worth considering how you can ensure that differently-able users aren't falsely accused of being drunk. E.g. A baseline metric of usage patterns of could be established while sober, and used for comparison. Thinking laterally, (depending on the ramifications / risk) rather than prohibit usage, you could try to provide assistance to the user while drunk. E.g. an extra-assistance mode - to prevent the worst from happening. As "dr jimbob" and the (correctly) negative commenters to Ravis's answer pointed out, since each person has different initial abilities and the environment differs from usage to usage (is user moving, multi-tasking, is environment shaking, is environment noisy/distracting, is user tired and so on...) you can not tell if a mobile user is drunk according to precision, responsiveness and intellectual skills. What you should consider is why the user must not be drunk and test according to that. If user must use accurate gestures, test that, but then take into consideration that any user that is incapable of doing so can not user the app. If user must solve hard problems, test that, but then take into consideration that not all sober users can use the app. If user must spell correctly without using a dictionary... well you should have got the point by now. If the user must be capable of good judgement, test judgement with questions and offer wrong yet funny answers and see if user can avoid them, yet as before... not all sober users will pass. If the test is for legal reasons, then the only solution is a hardware alcohol level tester with some way to prevent user from cheating. I had another idea. Voice recognition patterns. To calibrate, you enter a statement a few times until it has a baseline. Example: "vini vidi vici". When you turn on the drunk app, it asks you to enter your statment in before you dial or text. If you say "Veeeny Vee Dee Veeshee", it will notice the change and ask if you REALLY want to send this text. Or block you entirely. Almost like parental controls. "How drunk are you?" Please hit the corresponding point on this sliding scale. If the user says he's only a little bit drunk, give him an explanation of why he shouldn't use the service while drunk. Afterwards you ask him again how drunk he is. If he answers differently then the first time you log him out. How do drunk users act? What are some good ways to verify legitimacy of a commenter on a blog post? How many elements are too many for one screen of a mobile (iOS/Android) application? How do you convert computer users to mobile users? How is mobile information architecture different from desktop? How to categorize new threads in a mobile forum application? Can a mobile application be made using a totally flat design?